(August 17, 2006) Recordings obtained by Chile’s La Nación newspaper this week could finally lead to closure in the case of Boris Weisfeiler, the only American known to have been disappeared under the Pinochet dictatorship. The Russian-born mathematician vanished after a hiking trip in southern Chile in 1985. Weisfeiler, a Penn State math professor, is believed to have been turned over to the Colonia Dignidad German cult community by Chilean military officials, where he was most likely killed (March 28, 2006). The recordings obtained by La Nación were made by a novice radio enthusiast three months after Weisfeiler’s disappearance on April 2, 1985, and feature a conversation, in German, between Colonia Dignidad leaders Kurt Schnellenkamp and Gerhard Mucke. Until this week, there have been no new leads in the case since 1987 when a Chilean military informant told U.S. embassy officials that he was a part of a military patrol that arrested a foreign hiker and concluded he was a Russian spy. According to the informant, Weisfeiler was alive as of 1987 and held in Colonia Dignidad, now known to have been a torture center used by the Pinochet military regime (ST, July 25). Chile’s military has repeatedly denied arresting Boris Weisfeiler or handing him over to Colonia Dignidad. The recordings may finally bring an end to one of the strangest cases in Chile’s history. Followers of the case hope they will prompt presiding Judge Jorge Zepeda to interrogate Mucke and Schnellenkamp and find out the subject of the recorded conversation. Last month, Mucke testified to Zepeda that over 22 disappeared people were killed and chemically burnt at the colony (ST, July 25). Olga Weisfeiler, Boris’ sister, has led a campaign to uncover the truth of her brother’s disappearance. She has traveled to Chile numerous times and recently met with President Bachelet to discuss the issue. According to Olga, Boris promised to call her upon completion of his hike, but never called. 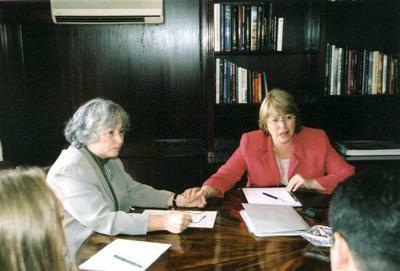 Olga’s campaign led the Pinochet government to conduct a cursory investigation, which concluded that he had drowned in a river, an account Olga never believed. Olga visited Colonia Dignidad in November 2004 to learn more about her brother’s disappearance. But she wasn’t able to find any answers. She told the Santiago Times that the Colonia’s new leaders were “evasive. They are not saying that he isn’t there, they just say that they are too young to know what happened 20 years ago. It is very depressing. I kept looking and thinking in which corner, under which tree, is my brother kept” (ST, June 8). Frank has repeatedly urged both the U.S. government and Chilean authorities to devote more resources to the case and to expedite a full accounting of what happened to Boris Weisfeiler. Copyright 2000-2005, All Rights Reserved — Design by The Chiron Group, Inc.